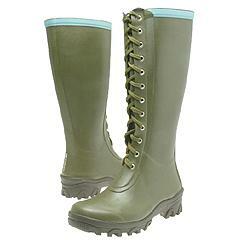 Why: Plain Jane rubber rain boots are so last season. These Tretorns have been featured in New York mag and I’ve spotted them all over the East Village, when the skies are clear with not a cloud in sight. Functional fashion is hot and these heavy-duty boots deliver. The height is perfect for tucking in your slim pants or skinny jeans. They look edgy cool with a skirt and tights. The thick sole feels weighty at first. Once you get used to it, the comfort of the cushiony sole and short heel are perfect in any climate. The laces lend hip military details and ensure the best fit. Specially handcrafted in Europe, Tretorns have a long tradition and since everything old is new again, this is one trendy tradition. Find It: Zappos.com Order your true size or a half size down, I found the boots run large.